If you’ve gone to engineering school or seen too much of “The Big Bang Theory”, you’ve probably heard someone say, with a semi-smug voice: “light isn’t a particle or a wave, it’s both”. After they’re done patting themselves on the back, they have a little harder time explaining why. But how can it be both? First, take a look at the picture above. That’s the duality of the wave and particle. Why is every particle entity both like a particle and a wave? Let’s get scientific about it and see how they both behave like a particle and a wave at the same time – the wave-particle duality. In the 1890’s, the German physicist, Max Planck, was studying a problem with blackbodies. Certain objects are called blackbodies because they emit electromagnetic radiation of all wavelengths. 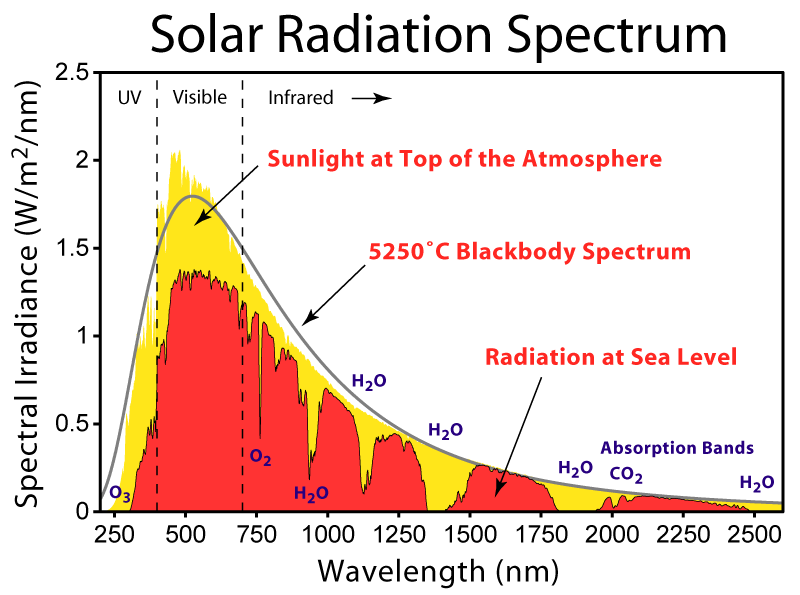 Blackbody radiation is an idealized physical body that absorbs all incident electromagnetic radiation, regardless of frequency or angle of incidence [https://en.wikipedia.org/wiki/Black_body]. An example of a blackbody is the sun. 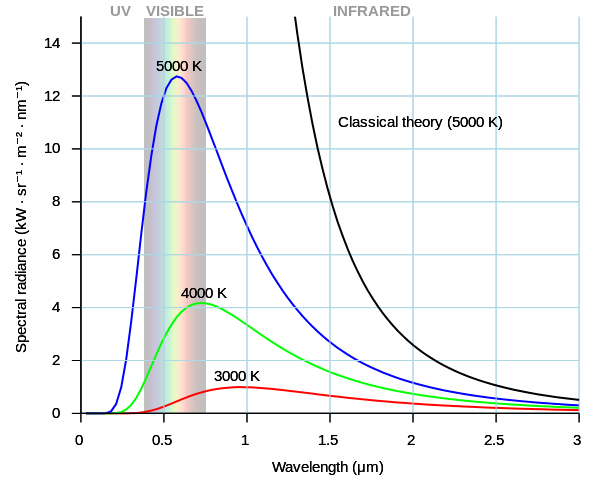 In the graph above, we see that we receive a lot of the light in the visible spectrum, and also in the UV and Infrared (and beyond). This is why our eyesight evolved to see in the visible range. A hot piece of metal will also radiate in the same distribution, which means that the distribution does not depend on material, but instead on temperature. The problem that Planck was trying to solve was that the greatest amount of energy that was radiated from a blackbody was near the middle of the electromagnetic spectrum (visible light), instead of increasing with the higher frequency (or lower wavelength), as classical physics suggested. Let’s look at this problem again through an example of a metal acting as a blackbody. Think of a light bulb with a filament, and current flowing through the filament. When the filament becomes hot, meaning when current is flowing through it, it becomes glowing red. Now, if you add a higher temperature to something that’s hot, it becomes more and more white, and you end up with a white-hot filament. Look at the graph above and think of the light bulb. Some of the current is converted to light, while the rest is mostly converted to heat (infrared). So, the color of the radiation is dependent on the temperature, or in other words, the wavelength is dependent on the temperature. Classical physics suggested that the higher the frequency (or the lower the wavelength), the higher the temperature would be. Just look at the black line on the graph, this is how classical physics predicted that the black body radiation would be. But measurements suggested that the radiation intensity started to decrease towards ultraviolet, instead of increasing exponentially, becoming infinitely large. This is known as the “ultraviolet catastrophe” [http://vergil.chemistry.gatech.edu/notes/quantrev/node3.html]. Planck had an explanation for this, but to understand it, first let’s see how heat occurs: In a solid, heat occurs when you have oscillations or vibrations at an atomic level. These vibrations are what generate the light we see. Planck explained that the only way the blackbody spectrum would work, was if the blackbody was made up of oscillators that could only emit light in discrete chunks, so that the electromagnetic energy could only be emitted in a quantized form, meaning discrete values instead of a continuous set of values. An example of discrete values would be: When you walk up some stairs, you increase in potential energy for every step you walk. But you can only take a whole number of steps – you can’t walk up 1.5 number of steps, therefore the potential energy you receive can only be discrete, not continuous. Energy on an atomic scale has only a discrete set of values, or quantized. More on this later. Where E is any possible energy, n is any integer (and can only be an integer), h is Planck’s constant, and ν is the frequency of radiation. Planck constant is 6.62*10-34 m2kg/s, which is incredibly small, and was able to explain why energy was different on a macroscopic scale and an atomic scale. This is the theory of quantization. Planck re-wrote the original equation that showed the blackbody radiation by incorporating his own quantization of energy in the blackbody radiation equation. Seeing energy as quantized values solved the “UV Catastrophe”. [http://www.informationphilosopher.com/solutions/scientists/planck/]. In 1905, Einstein hypothesized that instead of thinking of light as a wave, it was really a stream of photons, each with a discrete amount of energy. 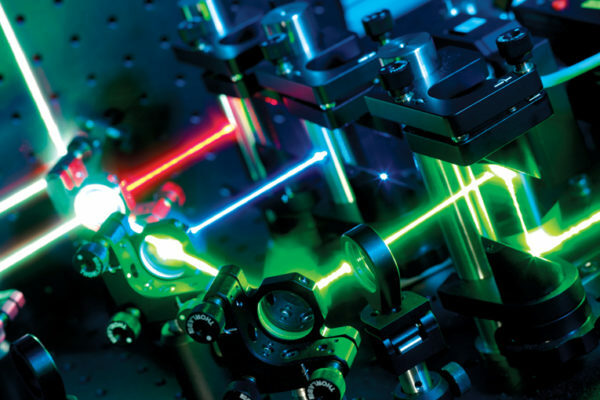 To learn more about photons, check out this link. 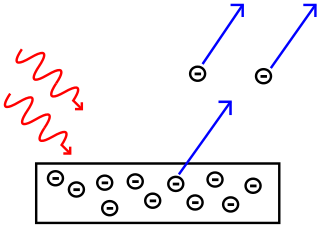 The idea of the stream of photons came from an experiment called the photoelectric effect, which is what Einstein received the Nobel Prize for. It is the phenomenon when certain metals are exposed to light, they eject electrons. This is because there are negatively charged electrons on the surface of the metal that are attracted to the positive charges in the nucleus of the metal, and when you send light of the same frequency (or photons), it can knock some of the surface electrons off. 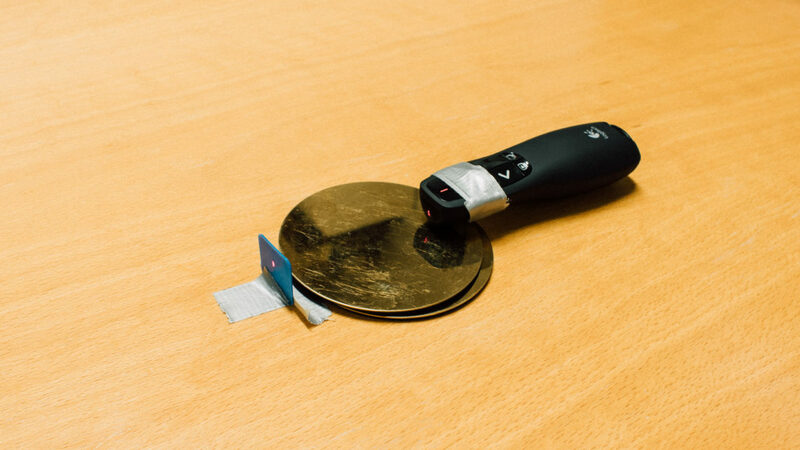 Einstein took a flash light and pointed it towards a metal surface, he noticed that only light above a certain frequency (or below a certain wavelength) caused electrons to be given off by the surface. Above that frequency, the higher the frequency of the light, the higher the energy of the surface electrons were given off. Einstein also saw that the electrons were emitted instantaneously, with no delay whatsoever, which could not happen if the light was a wave sweeping over the metal. This could only happen if the electron emissions were caused by individual particles of light. The next step of the wave-particle duality came from Ernest Rutherford (in collaboration with other physicists). He made an experiment where he shot alpha particles, which are positively charged, at a thin gold foil, and was stunned to find out that some particles deflected. 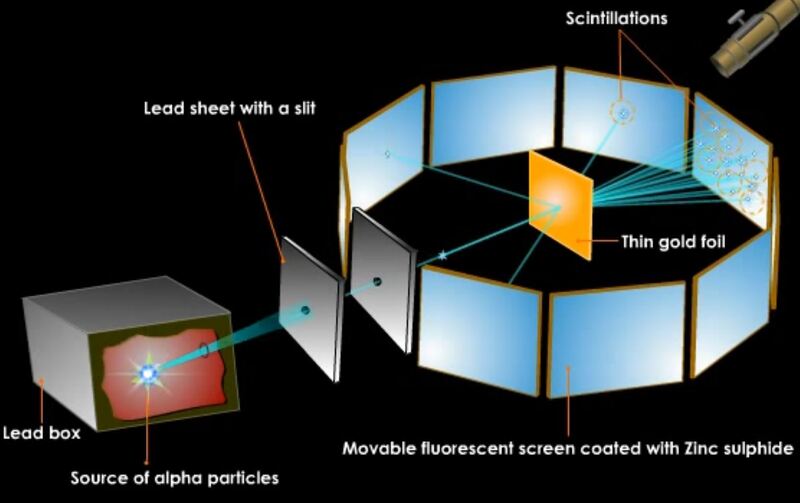 Alpha particles produce a small visible light when they hit a fluorescent screen. Since so few particles experienced deflection, it meant that the nucleus must take up a very small volume of the atom, and since alpha particles are so dense and still deflected, it must mean that almost all of the mass of the atom is in the nucleus. 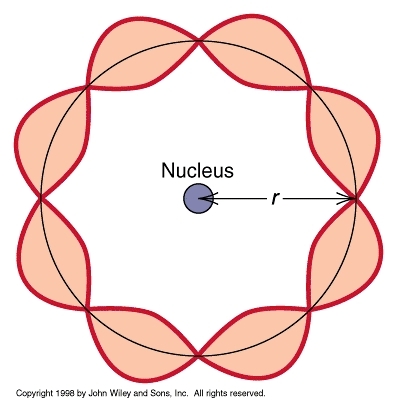 Rutherford envisioned an atom with a nucleus, with electrons orbiting around it. But this couldn’t be right. Scientist have shown that electrons have to emit energy when they move onto curved orbitals, so the electrons should lose their energy and might even fall onto the nucleus, making the atom collapse. Another scenario could be that an electron could be knocked out of position if a charged particle passed by. Niels Bohr had an explanation for this. In 1912, Bohr joined Rutherford, and realized the model wasn’t right. Bohr believed that the atom existed, but that classical physics couldn’t explain it. He found that the ratio of energy in electrons and the frequency of their orbits around the nucleus was equal to Planck’s constant. He proposed that atoms emit and absorb light only when electrons change orbits, meaning, that the frequency of the light depends on the energy difference between the energy levels (or orbits). It also explains why atoms emit only certain colors of light, since each element has its own unique orbits (and its own set of frequencies). [http://www.pbs.org/wgbh/aso/databank/entries/dp13at.html]. 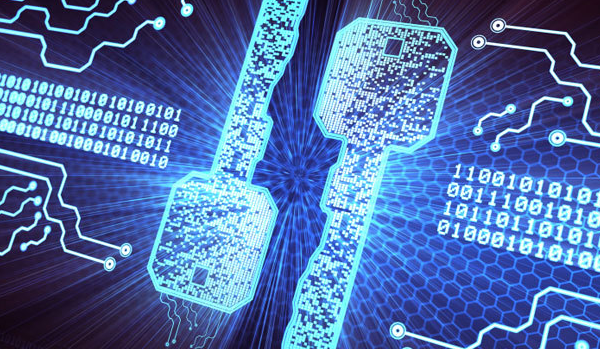 For a further explanation, check out our previous blog post. Why would the electrons be confined to only specified energy levels? Why does not electrons emit light all the time – they should when they change directions. In all fairness, Bohr was aware of the flaws in his hypothesis. The French physicist, de Broglie, came up with the hypothesis that if light, which everyone knew was a wave, behaves like a particle, then maybe the electron, which everyone knew was a particle, behaves like a wave. This could explain the problem with Bohr’s rule for how electrons could orbit a nucleus. Thus, de Broglie hypothesized that the electrons were acting like standing waves. And that the electrons were moving so fast around the nucleus, that they were in fact interfering with themselves. More on this shortly. We can prove this when we calculate that the wavelength for one electron, we get exactly the length of the orbit circumference of the electron. Meaning, the wavelength of the electron is exactly the length of one revolution – this is a standing wave. A standing wave is wave that is constrained to vibrate in a distance that’s exactly one multiple of its wavelength. Anything more or less would create destructive interference, and the wave would collapse. If it’s difficult to imagine how electrons acting as standing waves look like (this is a bit abstract), then try to think of a guitar string. 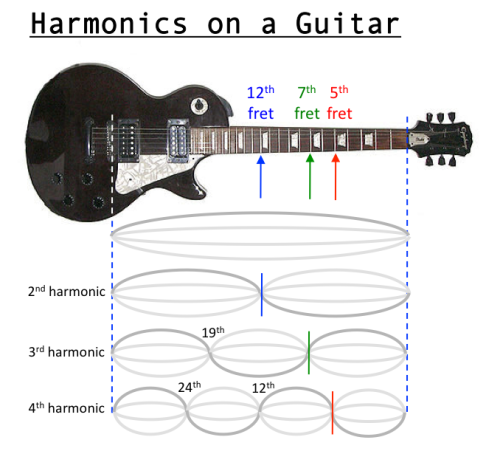 The standing waves of the different harmonics are the like the standing waves of the different energy states of an atom. where we think of the first fundamental as n=1, second as n=2, and so on. And the different standing waves of the different energy levels will be equivalent to the picture “The standing de Broglie wave”. So, the electrons exist as standing waves that envelop the nucleus, no orbital motion is required at all, and therefore no radiation is emitted. Electrons in an atom do not orbit the nucleus. 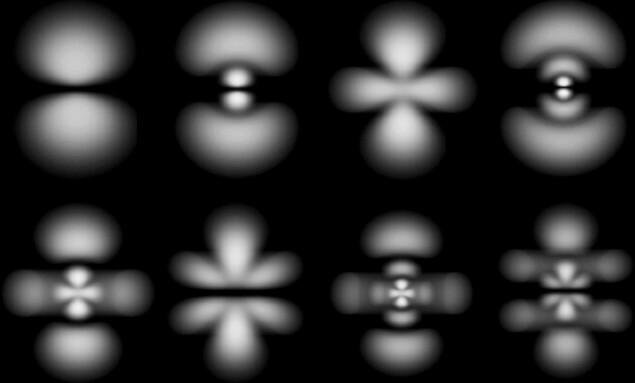 They exist as stationary standing waves. These wavelengths are known as the de Broglie wavelength, which you can learn more about here https://en.wikiversity.org/wiki/De_Broglie_wavelength. A few years after de Broglie, scientists had observed the wave behavior from electrons. This was done through what’s known as the double-slit experiment where they fired electrons through two slits, and saw that the electrons interfered with each other, creating a pattern like a wave. 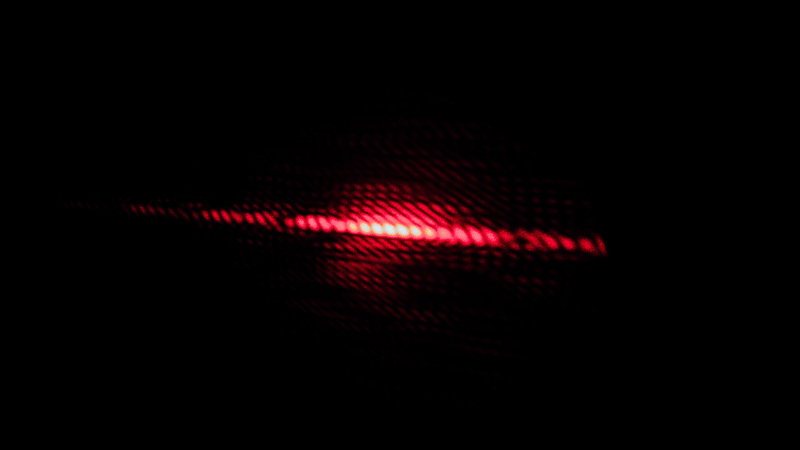 where we could see the electrons as particles on the screen, with the interference pattern of a wave. There you have it. The wonders of how some of the greatest modern physicists changed the known fact that light was a wave into the wave-particle duality. Fun fact: Around 1672, Newton believed that light was a particle and not a wave, but that’s a different story.